Teddy’s pod hurdled down the conveyer belt. The momentum pushed him into the chrome. His nub tail receded into his body. The stuffing churned in his belly. He hooked his paws around the bars. Orbs whizzed by in his peripheral. These were the other pods, micro prison cells just like his own. There were peeps all around. Teddy wondered if the sound was grease on the track until he realized the peeps were coming from inside those pods. He caught glimpses of silhouettes recoiling with hands over their faces. Teddy made the connection. The sound had been screams all along. The pod dipped. Teddy flew up. His paws shift up the bars. His ears smacked into the roof. His belly rushed into his neck. Further down the line, a blue light began to strobe. Sparks flew through the bars. The bear sucked in his belly so not to singe his fur. The pod swung back and forth. It jerked hard to the left then to the right. A blue flash revealed the space below. A sprawling cavern of arches and columns. The chain above began to unspool. The pod lowered. The cavern floor came into focus. It was not the image of polished marble tiles that had somehow gotten into the bear’s head. It was a field of metal grates, perforated so things could slip through. A low rumbling horn shook the cage. Its echo ran the distance of the space and off into the tunnels surrounding it. Teddy’s pod came to an abrupt stop in the center of the cavern. The floor swung out beneath him like a trap door. Teddy held steadfast to the bars. “Let go.” A voice boomed through the cavern. The voice’s echo had a journey ahead of it. Teddy relinquished his grip one paw at a time. The fabric that made up his bladder rose as he fell. Teddy crashed into the grates. They dug into his feet, cutting temporary toes. He tumbled end over end and lay sprawled out. A spotlight flickered on. Its beam was just wide enough to encompass the bear. “Get up.” The omnipresent voice boomed. Teddy scrambled to his feet. He spun around to look for the source of the voice. He caught movement out the corner of his eye. Shadows leapt across the arches. They scurried up the massive stone pillars. 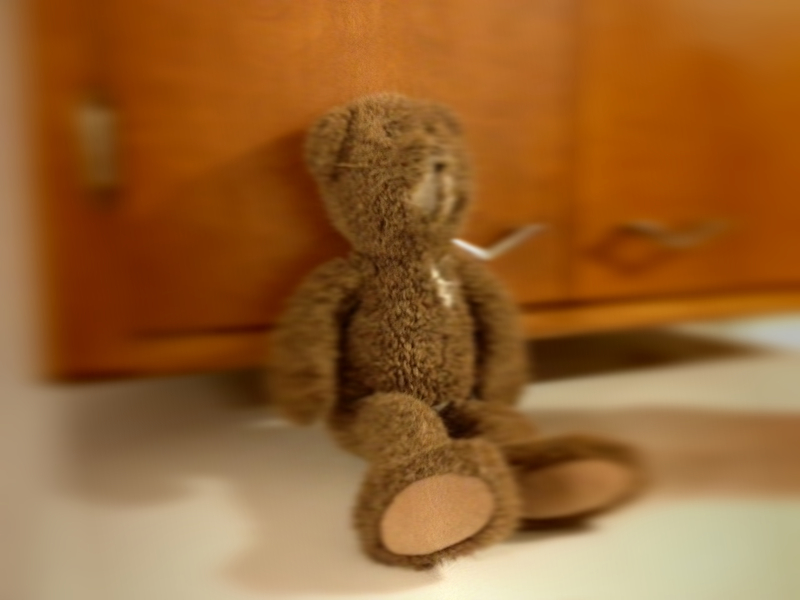 Teddy said, “What is this place?” His plush lungs were too tiny to produce an echo. The shadows danced across the pillars. They gave the illusion of light reflecting off of water. “Questions are unnecessary.” The voice boomed. With all of the movement around him, Teddy realized the voice was a chorus. It was the whole of the Dark Parliament addressing him at once. Teddy hadn’t the foggiest clue what the Parliament was prattling on about. He was only happy to stretch his legs. He decided to go for a stroll into the dark. The spotlight followed him, as did his pod like prison cell. “Thaddeus?” Teddy whispered to himself. “Teddy.” Teddy repeated. He didn’t like the way it rolled off his tongue, a meager two syllables. It had none of the formal dignity of Thaddeus Von Cuddlesworth the third. “Teddy,” wasn’t a name, it was a branding. Something you called an object to be discarded. Now “Thaddeus” evoked the image of a commanding aristocrat marching into the room with his chin held high. Teddy glanced up to find his pod swinging through the spotlight. He scurried to one end of the cavern. The pod followed. He scurried to the other end. The pod followed. He couldn’t shake it. This new information weighed on Teddy. The chance encounter with Chester Checkers, had lead him to believe life might be filled with whimsy and wonder. The Dark Parliament had reset his expectations. Life was a task to be carried out for reasons unknown. He was a piece on a board waiting to be played, nothing more. Teddy didn’t think much of the six lights ahead. Their circular positioning had been more interesting than the pillars behind him. So he set them as his destination. The lights were getting closer, six blue cubes set the horizon aglow. It occurred to Teddy to inquire, what intelligence they wanted him to collect. He opened his mouth when they cut him off. “Continue on its path.” The Parliament boomed. The circle of light came into focus. The luminescence was coming from somewhere inside the bases of the cubes. The cubes themselves were made of plexiglass and steel. Each had a series of tubes that ran from their backs down into the grating. There was a sudden rush of bubbles. Teddy almost jumped out of his fur. These were water tanks. Teddy staggered back at the sight of a something in the fluid. He didn’t know how he knew it was human. Nor did he know how he knew it was female, or that it was dead, but Teddy knew. Her skin was bloated. The husk had gone waxy. Marble vein patterns lead from her throat to her chest. A string of pearls orbited around her neck. Her earrings floated upward. Air pockets had filled her blouse. Lose rings dangled from the exposed musculature and bone where her fingers had been. Swirls of red danced around her. Teddy dare not look at her face. “Get up.” The Parliament boomed. Teddy waved a dismissive paw, “I’m good. I’ve got a pretty good view from here, thank you.” He nodded to reinforce his lies. “It gets up.” The Parliament boomed. “It will look into the creature’s eyes.” The Parliament commanded. “It will do no such thing.” Teddy muttered to himself. “It will.” The Parliament boomed. Teddy watched his pod begin lower. He sighed. The bear did as he was told. The woman’s eyes were wide open. They were milky white orbs in black sunken sockets. Her nose was flat. The skin around one of her nostrils had gone loose, it flapped in the water. The skin of the other was gone entirely. Her complexion showed no sign of life, save for the bruises on her cheeks. She was as white as a ghost. Her jaw had come unhinged. Her mouth hung open. The skin was torn at the corners. Her lips were frayed. Her tongue bobbed inside her mouth, a serpent squirming against the bubbles. Teddy felt the breath seep out of him. He had seen enough. The world was not at all what he had been expecting. He wobbled forward. His paws fell against the glass. The frequency of bubbles increase at his touch. Teddy stepped back from the glass. He pawed at his neck, apart from being a knotted mess of fur, it was fine. Who the hell was Isobel? He looked back to the figure behind the glass. There was a line across her throat. This was the source of the mist seeping through the water. Teddy wondered if her wound would leak forever. He shook his head and spat through the grate. “What just happened?” Teddy asked. “It does not ask questions–” The Parliament began. “Clearly it does.” Teddy cut the chorus off. Was this body an idea as Teddy had been, or was her demise? Teddy looked up to find the Dark Parliament had converged. They blot out the pillars around him. Only the light of the water tanks remained. “It should study these creatures.” They boomed. Teddy glanced back. He tried to fix his gaze on the green shawl wrapped around her head. He tried to follow the feather patterns bobbing up and down. It was all he could do to avoid looking the poor woman in the eyes. Teddy rubbed his button eyes. He was happy to find his fur had clouded his vision.